The fact is that, to date, the SEC has not been enforcing a high standard for XBRL data quality (in fact, they’ve been very permissive of poorly built code). So we are gratified by the SEC’s (belated) shift toward a higher standard, because we believe that XBRL will be a worthwhile endeavor only after the data available is of a sufficient quality to be usable to analysts and investors. There is a “clear demand for timely, structured, machine-readable data” among investors, but only a minority of the data is currently good enough. We believe that as a result of pressure from Congress and the data community, this Comment Letter will be the first step as the SEC continues to increase their enforcement standards. RDG Filings has been preparing for this “ratcheting up” of enforcement since the inception of the XBRL mandate, and we have always taken steps to ensure the quality of the XBRL code we create for our clients meets and exceeds the SEC’s current standards. RDG has always been committed to building the highest quality XBRL, and we have continuously developed and expanded our expertise and knowledge to remain proactive in this area. Many companies who create their XBRL using in-house software (or who have it built by the software company) desire a higher degree of confidence that their XBRL code will not raise flags with the SEC and will be most usable to analysts and investors. 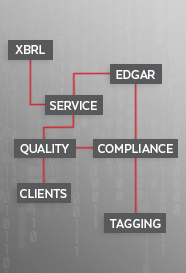 For these companies, RDG Filings provides independent, 3rd party review of XBRL code. Our XBRL Quality Assurance Services are designed to ensure XBRL data is in line with the strictest standard for excellence available anywhere. For more information about our XBRL QA Services or about what additional changes we believe are coming from the SEC, please contact us.